Bootle, Lancashire 1955 (four weeks) See the Wickmere page as to why we were here. I only have the vaguest of memories here - and those not very nice. The horrors of a school lunch - rows and rows of children; the noise was so horrendous that I was very frightened, refused to eat and had to be taken back to where we were living. My parents were not very happy with me! I also remember the congestion of the playground, where being run over by big children made it seem utterly dangerous. Nor could I understand what anyone was saying - my ears were not attuned to the local accent. I was six years old. 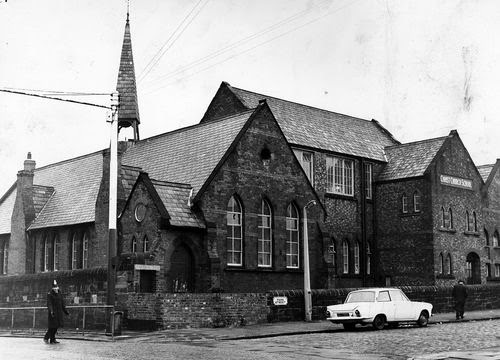 The old Christ Church School, Park Street Bootle. The school now used as a community centre. Picture taken in 2011 - my first visit back. The sort of street we would have lived in. I vaguely remember our Rectory furniture all squashed into a tiny space. Christ Church in Bootle, 2011.